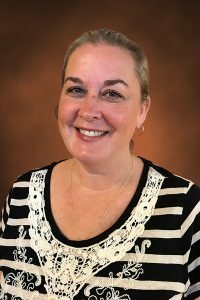 Kimberly Weeker – RUSH, Inc.
Kimberly Weeker has worked as Receptionist/Office Coordinator at RUSH Construction since October 2018. Weeker’s responsibilities include a variety of administrative tasks, but primarily she is the first voice heard, or first face seen when interacting with RUSH Construction. Before joining RUSH, Kimberly was already familiar with the company’s long-standing reputation for integrity and quality. “An opportunity arose to join the RUSH staff, and I was excited to get my foot in the door,” says Weeker. Weeker grew up in upstate New York and regularly saw horse and buggies riding down the street as there were a sect of Amish called Mennonites living in the area. “It was a beautiful place to grow up,” says Kimberly. Happily married to her husband, Brett, since 1999. Kimberly enjoys golfing when the weather is cool.